The plucker is well balanced and free standing with a capacity of 12kg (live weight) per minute that is 360 x 2kg, 480 x 1,5kg ..... birds per hour. The machine has a low power consumption, driven by a 1,1KW motor 380V, 3 phase as standard. Single phase motors and other voltages are optional. The motor is mounted high at the back of the machine under the starter box out of the general water splash area. The starter box is large enough for the addition of timers, o'load relays etc. to be fitted if required. The motor shaft has a lip seal between the shaft and the motor casing to prevent the ingress of water into the top bearing housing. A shaft seal located on the bottom of the frame is there to prevent water spray from the plucking bowl entering the lower pluck head bearing. The tilting bowl action eliminates an ejection door with hinges etc. This makes the construction of the bowl stronger, resulting in a smoother inside finish that is easier to keep clean. The loading door hinge is an integral part of the plucker bowl covering the whole length of the door. A harness bolted to the top of the bowl gives rigidity and accommodates the tilting mechanism. 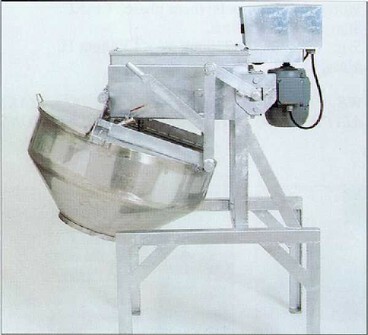 The bowl harness has two stops on the side of the machine frame that ensures the bowl being held securely in place during the plucking cycle. The plucking head uses a standard plucking finger ±80mm long that pulls into a hole of 19mm diameter. The Pluck fingers are arranged in a spiral sequence moving upwards to turn carcasses over during plucking. A medium to hard plucking finger is preferred (55 to 60 degrees Shore A hardness), as the plucking finger has to pluck, as well as, turn the birds for all round plucking. The pluck finger consumption is about 1 finger per 1500 birds plucked. This figure may vary if the machine is overloaded and worn or broken pluckfingers are not replaced timely (or with poor rubber quality). The main frame of the plucker is made from heavy gauge mild steel, completely welded and hot dip galvanised, thus giving complete rust protection outside and inside the tube sections. All bolted connections on the frame and the pluck bowl are Silicon sealed for hygienic reasons.